More than 40 Years of Sailing Spirit! According to early Viking historians, the Viking Sailing Club was formed on April 17, 1967. At that time there were 50 people who paid $50 apiece for membership. The first official day of sailing was June 3, 1967 which saw the entire fleet (that being three Flying Juniors) hit English Bay with great enthusiasm. Reportedly, the original 12 founding Vikings were… Bill Lucey, Peter Barrett, Gwen Patrick, Ralph Sebastian, Al Cox, Clive Southey, Erica de Jong, Alan Jackson, John Mcdonald, Ron Wade, Sonia Williams, and Mike Wiggins. In 1968, two more dinghies were purchased and a clubroom was rented in the basement of the Jericho Tennis Club. Ralph Sebastian designed the Viking burgee (which you see at the top of this site) in May 1970. 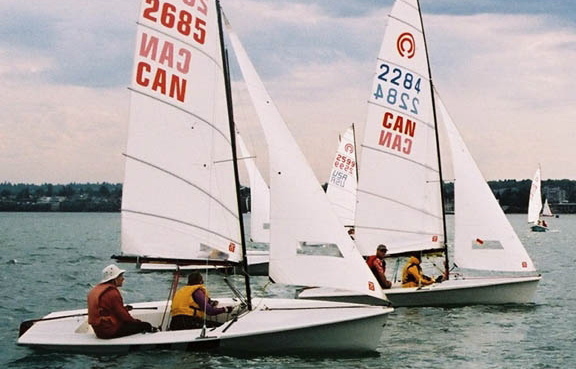 In 1973, a committee called the “Jericho Sailing Committee” was elected to work with the Vancouver Board of Parks and Recreation to write specifications for a sailing centre. Ralph Sebastian, then Commodore, and many Viking members were instrumental in the development of what is today known as Jericho Sailing Centre Association. The building had been a Royal Canadian Air Force seaplane hangar in the 1930s and ’40s (including during World War II), and a maintenance hangar for aircraft until 1961 when the federal government dissolved the base and gave the land to the Parks Board. In 1974, the Vikings built a temporary chickenwire and plywood hut outside the hangar, and later established a clubroom in the west side of the Jericho hangar. 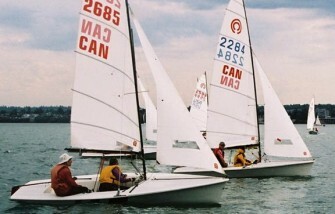 Three years later, the club changed its dinghy fleet to six C-Larks from the Flying Junior class. These served us well until 1981 when the C-Larks were replaced with three Albacores and three Tasars. During subsequent years, further additions were made to the fleet, Keats Island expeditions became legendary, and many members came to credit the club with introducing them to sailing and some lifelong friends. With current membership limited to 125, the club has frequently been in the enviable position of having a waiting list of prospective members. Although originally formed as a dinghy sailing club, the interest in keelboats has a substantial history. In May 1969, a Cal 25 named Valkyrie became the first club cruiseboat. It wasn’t long before the quest for bigger and better boats ensued. In 1977, Valkyrie was replaced by a Paceship 26 named Cayuse. In December 1983 it was was replaced by a Yamaha 30 named Starwatch. In 1988, the club replaced Starwatch with a Catalina 30, named Viking Spirit. NorStar, a 34-foot Catalina sloop, was purchased in 1994. It served as the club cruiseboat and flagship until 2001 when a new Catalina 34, which continued to bear the Norstar name, replaced it. In 2008 we commissioned our new flagship cruiseboat, a Bavaria 34, Freya, which we replaced eight years later in 2017 with another new Bavaria 34 cruiseboat, Tyra. Club chartered cruises have become a highlight of the season, giving our members a terrific opportunity to appreciate some of the best cruising the Pacific Northwest has to offer. Still going strong at 50! The Vikings have come a long way. Prudent planning by early executives has helped our club to become the envy of many co-operative clubs. We are celebrating our 50th anniversary in 2017 with a gala that includes many of the past members as well as city leaders. We look forward to many more fun-filled years of sailing.